Food aggression in dogs is a form of resource guarding in which the animal is abnormally protective of edible items. Some dogs even go so far as to “guard” their humans’ food. The issue of food guarding can be particularly difficult to deal with because it is considered a normal canine survival instinct. Understanding the problem is key to managing it within your home and beyond. What causes food aggression in dogs? There are several reasons a dog may develop food aggression. Competition for limited nourishment among puppies is often thought to spark the behavior at an early age. In fact, according to dog trainer and educator Steve Frost, there can even be a genetic component. The natural instinct to resource guard is reinforced by real life situations the animal encounters. Food aggression can also be a problem in rescued strays. During their time on the streets, these poor pups learn that each meal could potentially be their last. 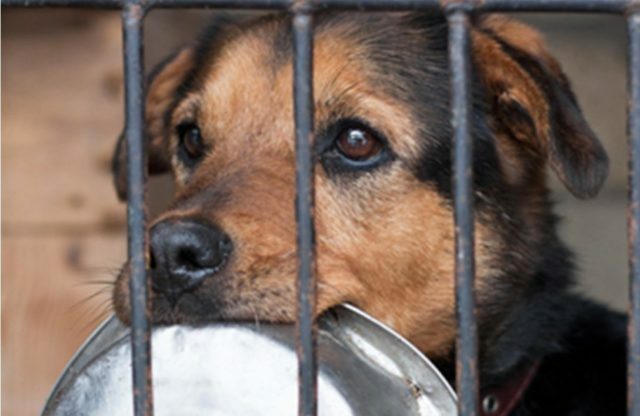 Sadly, even owned dogs may experience food shortages that set off their guarding instinct. Neglect, blatant cruelty, and competition from other pets are all potential triggers. What are the different types of food aggression in dogs? Resource guarders may act out towards other pets, humans, or anyone they see as a potential threat to their life-giving nourishment. They may growl when approached while eating, chase another pet away from their dish, or snap at a child who reaches for their chew bone. As mentioned above, some may even aggressively guard their humans’ food, such as scraps dropped on the floor by a toddler. Without rehabilitation, those that snarl and snap at humans run the risk of being turned over to shelters or even put to sleep. On the other hand, dogs that focus their aggression towards other pets can be even more difficult to rehab. It is also extremely important to understand canine body language so you realize when your pooch is feeling stressed or threatened. Instead of feeding all your dogs together in one area, separate their bowls to different areas of the room or house. Train your dogs to go to their individual spots when meal time is announced. 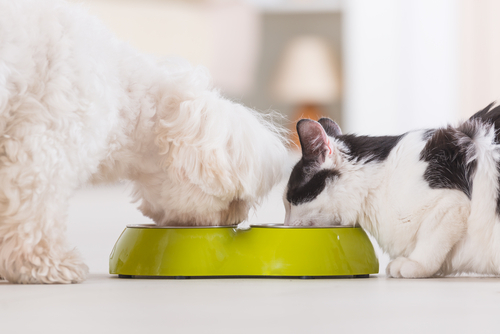 Be sure to monitor meal times to prevent other people or pets from entering your dog’s space. Ensure that your resource guarder gets enough to eat, but does not steal food from your other pets. Maintain a safe distance between pets during treat times. When heading out in public with a food aggressive dog, be open, honest, and above all, vigilant. Inform anyone who may interact with your pooch that treats and snacks are a no-no. If your dog will be boarding or participating in play sessions, disclose the food aggression concern to the staff. Many businesses reserve the right to refuse service to aggressive dogs, so be prepared for this possibility. How to prevent food aggression from developing. Sit with your dog during mealtimes and hand-feed a single bite at a time as you gently pet him and speak in a soothing voice. 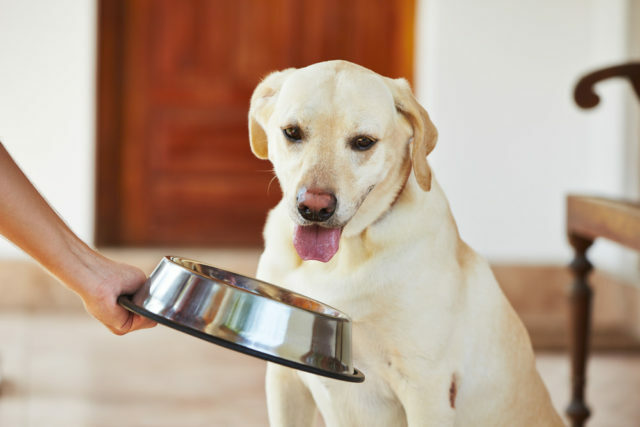 If your dog remains calm and relaxed during the hand-feeding process, try placing the food bowl in your lap and have him eat from it as you continue to pet and praise him. After a few meals, if your dog is still not showing any signs of food aggression, move the food bowl to the floor. As he eats his regular food, periodically reach down to drop in a particularly desirable treat like a small bite of cheese or meat. These steps should help your new pup remain calm and relaxed when eating in your presence. What NOT To Do When It Comes to Food Aggression in Dogs. Frost warns that punishing a food aggressive dog is not only ineffective, it may reinforce or worsen guarding behavior. 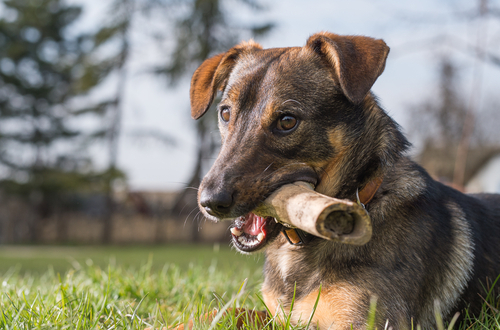 Owners who take away a treat or bone as punishment for guarding run the risk of exacerbating the problem. Frost explains that this only serves to teach an already aggressive dog “that a lower-level guarding behavior wasn’t enough to keep that coveted item.” He recommends resisting the urge to intimidate, threaten, or punish your resource guarder. When to seek professional help for your dog’s food aggression. The ASPCA offers desensitization and counterconditioning exercises to help pet owners eliminate the problem at home. However, unless you have prior dog training experience, issues of aggression are best left to the professionals. Frost suggests finding a trainer who has experience dealing with food aggression in dogs using positive reinforcement techniques. Consult a board-certified veterinary behaviorist if the problem is extreme. You can find one in your area by clicking here.